* Fully adjusable steering column with center-mount instrumentation for easy operator reference. * A seven-way adjustable seat providing a comfortable ride for the operator. * Excellent 360-degree visibility is achieved by positioning the operator above instead of behind the load for safe operation and excellent view of the attachment. * Models feature comfortable and easy-to-access grab handles to assist entry and exit. * A complete cab enclosure option provides enhanced comfort and safety for all-day-long operation. * Cab doors have an extended-latch design, which allows latching in a slightly-open position for limited ventilation, per operator preference. * Standard cab models equipment includes heat, four working lights, wipers on front and rear windows, a cup holder and adjustable side mirrors. * Spacious surface window area offers excellent all-around visibility. * Generous sound absorbing material between the cab and engine compartment is standard with cab enclosure and suppresses sound levels. 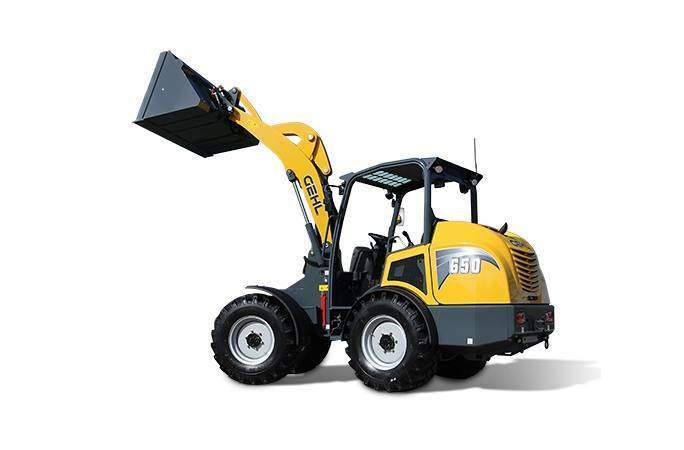 * Inching pedal allows operators to vary the ground speed while maintaining a fixed engine speed, to optimally run attachments while enabling precise control. * Engine speed can be conveniently controlled two ways: (1) with the right foot throttle or (2) with the convenient hand throttle, which also allows the ground speed to be controlled independently of engine speed. * Differential lock button on joystick increases traction for 100% effective engagement of axles. * 2-speed hydrostatic drive can be activated “on the go" by a switch on the joystick. 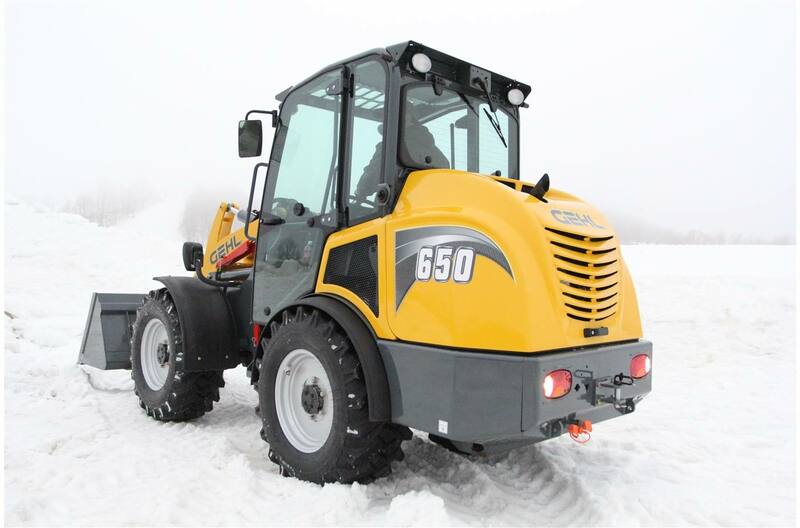 * Powerful, quiet and efficient Tier IV-certified Yanmar diesel engines with excellent performance for all applications. * Excellent reputation for reliable cold-starting and smooth operation. * Two auxiliary hydraulic lines with flat-faced couplers power a variety of tools and make attachment changes easy. * Hydraulic hoses are nestled within the lift arms, keeping them out of the loader linkage “damage zone" during lifting and dumping operations. * Lift arm and bucket float features allow for “floating" of the lift arm for light scraping or rear-ward leveling actions. Bucket float is a special feature that adds control and more operator flexibility for operating certain attachments with only bucket float. * Linkage becomes recessed in the lift arm at full lift heights for protection when dumping into trucks/trailers and provides excellent forward visibility. * Linkage design allows for mechanical self-leveling action in both up and down directions. * Nitro-steel rods on the hydraulic cylinders resist abrasion, pitting, scratching and corrosion. * Excellent bucket dump angles at the mid- and top-ranges of the lift path as well as outstanding forward reach at mid-range. * A heavy-duty articulating joint offers 45-degree turning angles each way and provides optimal maneuverability with a tight turning radius. Articulated steering has minimal affect on turf and ground surfaces and extends the life of the tires. * Chassis oscillates 10 degrees each way, for 20 degrees of total oscillation, to maintain traction by keeping the wheels on the ground on uneven terrain. * The tail follows where the front leads, providing excellent maneuverability. 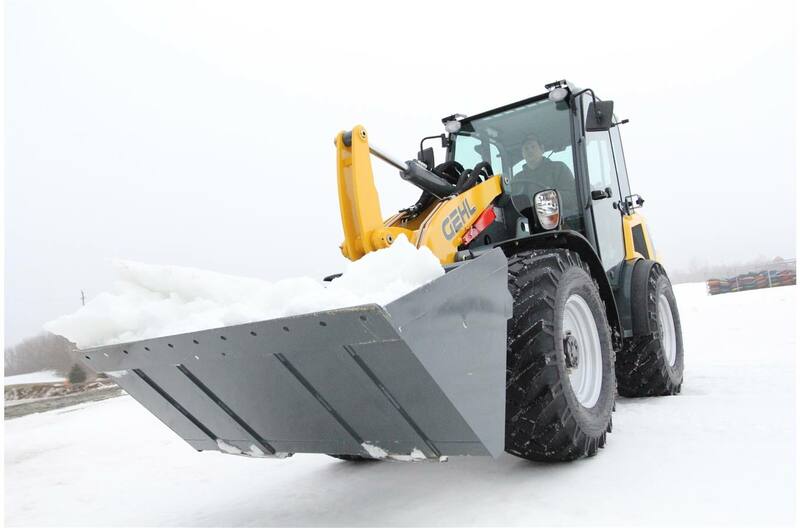 The bucket and tires follow a constant turn radius, so the rear of the loader follows the path of the front tires. * Narrow machine width allows access to tight, confined spaces that most skid loaders with comparable operating capacities cannot access. * High ground clearance allows the loaders to pass over objects in the work-path with ease. * Perform daily service checks with ease through the rear engine cover, which provides access to the engine, hydraulic reservoir filler and filter, radiator, and more. * Hydraulic components are provided with diagnostic test ports for easy access when required. * LCD display has menu screens with light indicators for electrical diagnostic checking. Length with Bucket on Ground: 199.9"
Front Wheel Center to Pivot Pin: 32.8"
Height to Top of Cab: 97.1"
Bucket Hinge Pin Height: 130.5"
Ground Plane to Bucket Edge Height: 123"
Dump Clearance at Full Height: 99"
Dump Reach at Full Height: 20.9"
Width Over Tires - Standard / Wide: 64.7" / 79.4"
Tire Gauge: 48.4" / 62.8"
Turning Radius with Bucket: 143.2"
AA Attachment Pivot Clearance: 7.5"
CC Bucket Width - Standard: 66"